Bally gaming software created the Morocco Slot which contains 243 different winning combinations. Although the graphics aren’t incredible, the game still has an exotic atmosphere. Spin the reels and you’ll see belly dancers and previous gemstones. 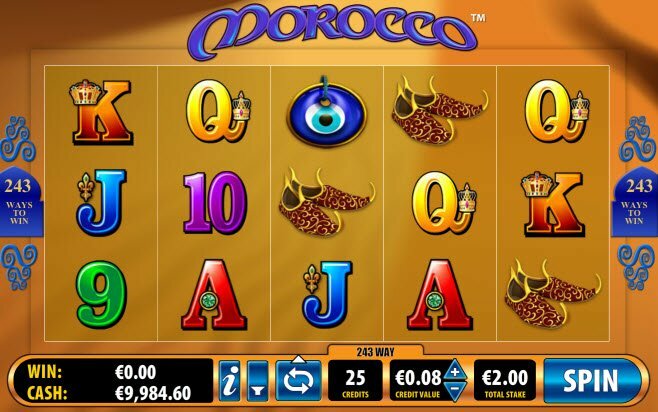 With 243 ways to win, you’ll be sure to walk away with riches after playing the Morocco Slot! The graphics don’t make the grade, but the game contains many lucrative features. The Free Spins Feature rewards Multipliers up to 250X! In addition, the game includes an Expanding Wild which gives you an even greater chance of hitting winning combinations. Play Morocco Slot and you'll quickly realize the graphic and sound quality aren’t the best in the business. However, the atmosphere of the game will send you on a magic carpet ride to an exotic land. Sip some mint tea while enjoying the exotic sights, and picture the delicious smells of a Moroccan market. The lovely belly dancer serves as an expanding wild and wiggles her hips during a winning combination. Fez hats, golden slippers, precious jewels, and the evil eye all spin across the reels during the game. Unlike most slots, the Morocco Slot gives you 243 ways to win! Chances are in your favor with this one. On top of that, the game contains several bonus features that award massive Multipliers and lots of Free Spins. Like all slots, the object of the game is to achieve winning symbol combinations by spinning the reels. However, unlike most slots, the Morocco Slot gives you 243 ways to win! Chances are in your favor with this one. On top of that, the game contains several bonus features that award massive Multipliers and lots of Free Spins. The Mansion Bonus Symbol awards 10-25 Free Spins plus Multipliers of 100X-250X depending on how many icons appear on the reels. 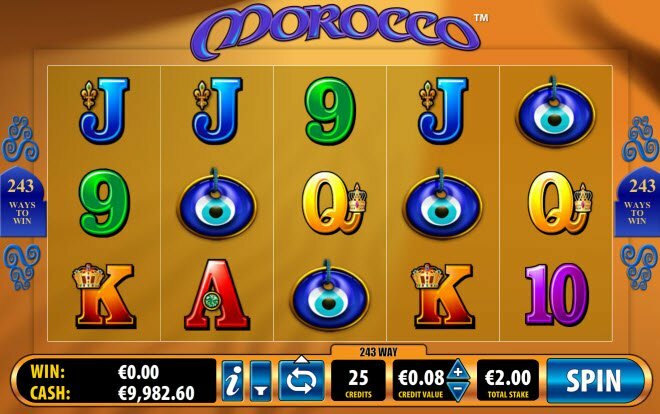 During Morocco Slot Free Spins, new features become active. Any winning combination on reels 3 or 4 become Wild and multiplies that winning. If you win on both reels 3 and 4, you receive a multiplier of 6X for that win. The beautiful belly dancer serves as the Wild Symbol. If she appears on the reels, she becomes an Expanding Wild and stretches across 3 reels positions. In this way, you have a much greater chance of scoring a winning combination.